A radiologist is a medical doctor who specializes in diagnosing and treating disease and injury through the use of medical imaging techniques such as MRI, XRAY, CAT SCAN, PET SCAN, fusion imaging and ultrasound. When your doctor informs you they have reviewed your scans that typically means they have read the radiology report performed by a radiologist. 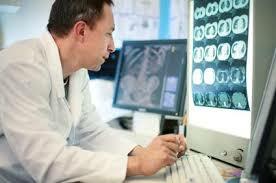 Most radiologist are board certified by the American Board of Radiology. MRI Pricing: What Are My Options if I Can't Afford an MRI?